Double Chocolate Coconut Flour Muffins – naturally sweetened with no added sugar, and a paleo friendly snack. 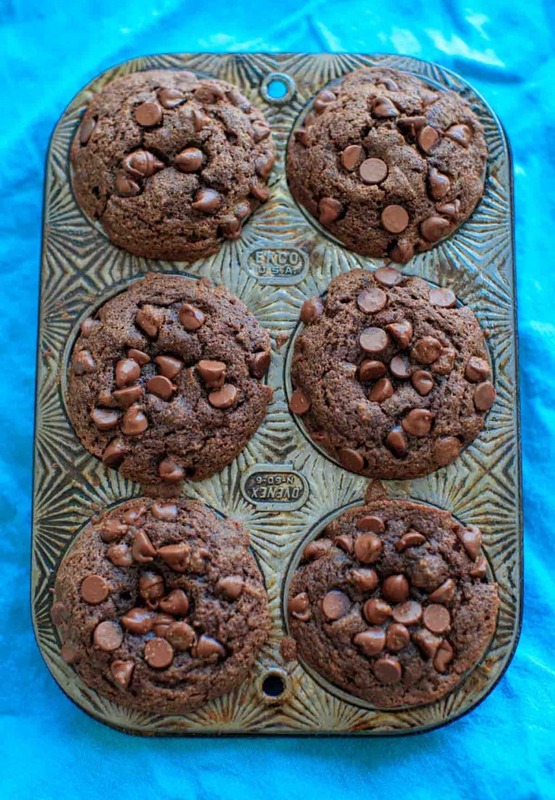 You may have noticed the title says these double chocolate muffins were made with coconut flour. Say what? There are all sorts of gluten-free flours these days. Coconut flour is one of those that I’ve commonly seen at grocery stores but never quite knew what I would do with it. Luckily my fellow blogger friend Regina over at Leelalicious.com wrote a cookbook ALL about what to do with it! 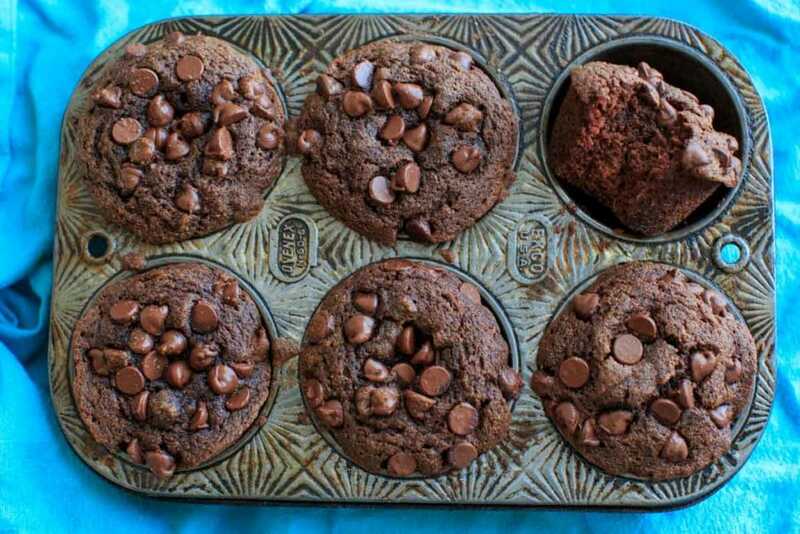 This double chocolate coconut flour muffin recipe is one of 25 recipes in her e-book of clean eating muffins, pancakes and mug cakes. 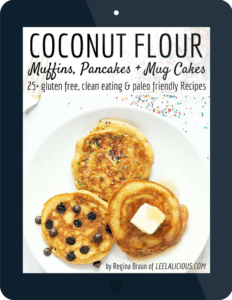 Click here to check out the full table of contents for her coconut flour e-cookbook and grab a copy while it’s still only $9. KEEP SCROLLING to the end of THIS post to enter the giveaway to win a copy or one of several other prizes (including a Blendtec)! When I got my copy of the cookbook, it was hard to decide what recipe I wanted to try first. But I figured I couldn’t go wrong with chocolate! The thing about baking with coconut flour is apparently the texture can end up too coarse or gritty. For that reason, Regina suggests mixing it with tapioca flour for some of the recipes, which works as a thickener. If this scares you, don’t worry – I have some substitutions. Trader Joe’s doesn’t seem to carry tapioca flour (also known as tapioca starch) but if you shop where Bob’s Red Mill products are sold they have a good option. Or online. But if you can’t find it or don’t want to buy it, you can use any starch. The ratios may be different so be sure to google it, but my suggestion would be cornstarch. Cornstarch is not paleo friendly (which is how this cookbook is meant to be), so if that is important to you then an arrowroot starch or potato starch might be better suited as a substitution. If you do use corn starch, the ratio is 1/2 of what the tapioca flour would be. This recipe called for 1/4 cup tapioca flour, so I replaced it with 1/8 cup (2 tablespoons) of cornstarch. I was so impressed with how these muffins turned out, I can’t wait to try some of the other ones. Coconut flour has now been “tried” and “eaten” and deemed worthy to continue experimenting with. In order to celebrate the e-cookbook release, we have organized a giveaway! Prizes include a Blendtec blender, coconut prize packs from BetterBody Foods, and of course some copies of the cookbook. Be sure to scroll to the end to enter! It runs until 11:59 PST on April 5, 2017. Good luck! Double Chocolate Coconut Flour Muffins - naturally sweetened with no added sugar, and a paleo friendly snack. Preheat oven to 375°F. Grease or line a muffin pan. In a small mixing bowl, add coconut flour, tapioca flour (or substitution), cacao powder, baking soda and salt and whisk together. In a separate bowl, whisk together the eggs, melted coconut oil, maple syrup and vanilla extract. Add flour mixture to wet ingredients and stir to combine. If batter seems dry, add coconut milk as needed. Divide batter into muffin tin cavities (will make 6 large muffins). Sprinkle chocolate chips on top. Bake for 15 minutes or until toothpick comes out clean. Let cool for at least 10 minutes before eating. Tapioca flour (starch): if you can't find it or don't want to buy it, you can use any starch. The ratios may be different so be sure to google it, but my suggestion would be cornstarch. Cornstarch is NOT paleo friendly (which is how this cookbook is meant to be), so if that is important to you then an arrowroot starch or potato starch might be better suited as a substitution. * Recipe slightly adapted from the Coconut Flour e-cookbook, and reprinted with permission. These muffins look incredible! I’m gluten free, but I’ve never worked with coconut flour before. I can’t wait to try it! So, those are totally gorgeous! How can they not be: double chocolate says it all! I’ve never worked with coconut flour before. Does it taste like coconut in the finished product? Love! Double Chocolate! What a great way to tiptoe into using coconut flour – with something so decadent that you’ll want to eat every single bite. I’ve not used anything but traditional flours and have been intrigued by the “newer” varieties available. What great looking cupcakes and no regular flour at all. I bet the coconut flour puts an added depth to the taste. And the double chocolate would certainly satisfy that chocolate craving. Very tasty. Yum! These muffins look amazing! I’ll have to grab some coconut flour and get to experimenting too. First up, these muffins! These are muffins that are safe for both my daughter and granddaughter to eat. I have got to bookmark this recipe and get some coconut flour. You have managed to make DOUBLE chocolate muffins healthy, I wish someone would please give you a prized. Love the pan of yours, too!! I have never worked with coconut flour but you got me with Double chocolate. I need to go look for that coconut flour. Sounds so yum. Love the combination of coconut and chocolate. Your muffins turned out beautiful– I made Regina’s pumpkin muffins and her chocolate mug cake, and the texture in her recipes is perfect, which is an accomplishment with coconut flour! I was pretty excited to see this as often I find GF recipes and they use odd flours that I can’t easily get hold of. But we get coconut flour in the local grocery store here rural Australia. Wooo. My Dad can’t tolerate wheat, so these are going to be perfect to make for him! I agree! A lot of times I just skip a recipe with weird flours, but I really enjoyed baking with coconut flour. Let me know if you try it! You are speaking my love language – double chocolate! Yum! I would definitely be making these first thing too! Good choice! I’ve a bag of coconut flour in the cupboard which is feeling very unloved. I’ve only used it once and without much success. I’ll give your recipe a whirl with it because those muffins look gorgeous. These muffins look yummy. It’s so funny…my hubby and I were discussing making macarons with coconut flour the other day. Have no clue if it’s possible but hey, it just might be. I made Regina’s Coconut Flour which turned out great, can’t wait to try these Chocolate Muffins next! They look delicious. Oh my goodness, I need to make these TONIGHT! Yes to double chocolate, always 🙂 And love the coconut flour aspect, too! Love the double chocolate in these! I really need to try baking with coconut flour! These look so delicious !!! I’m a big fan of double chocolate chip desserts and this is so easy to make too. Loving the pictures and that muffin tin looks so pretty. Thanks Regina! I so enjoyed your cookbook and my first experience with coconut flour! A blueberry lemon coconut flour muffin. Those muffins are stuffing by the way. I love the pan! 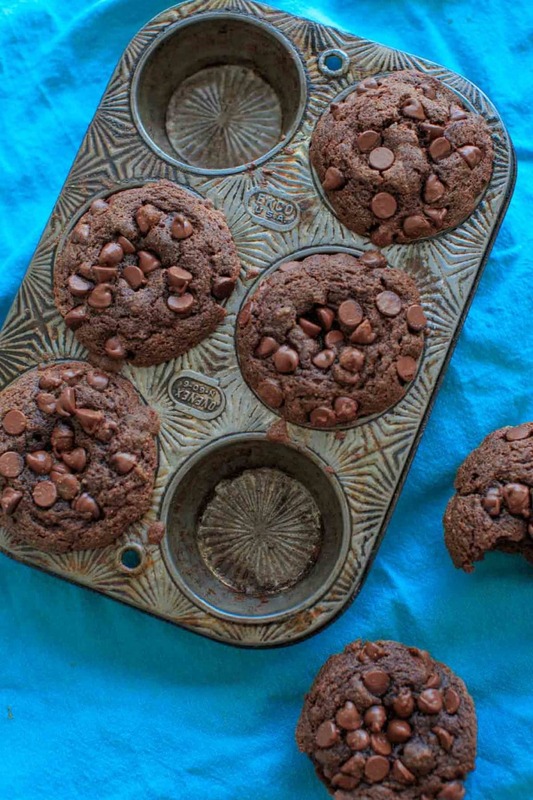 I definitely want to make these Double Chocolate Coconut Flour Muffins first!! They look so deliciously, decadent! I recently saved a recipe using coconut flour for pancakes! Thanks so much for the awesome giveaway. Chocolate is great, but the apple muffins (maybe with pear, too) are calling my name! These look sooo good! Can’t wait to try them. Thanks for the recipe, and the giveaway! These look amazingly delicious, and I imagine my kids would love to make them with me. All of the coconut flour recipes look delicious, but I’m going to have to start with these. Oh wow I just found your blog and am so excited. All your recipes seem to have my name on them. 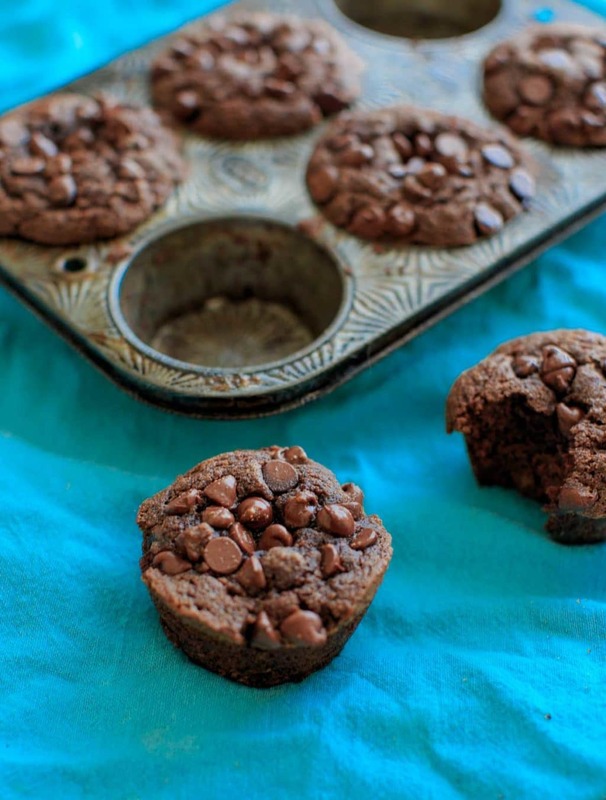 I’ve been looking up double chocolate muffins to suit my craving… these are perfect! Thanks Cora! Let me know what you try first! 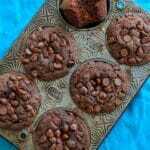 Can’t wait to try these double chocolate coconut flour muffins. They look delicious and so inviting in that retro muffin tin! 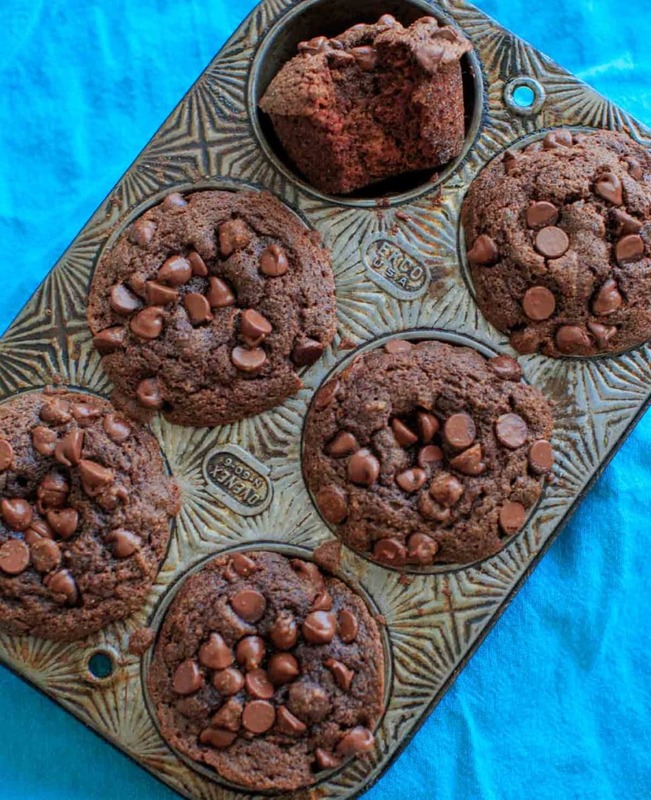 I want to try these coconut flour chocolate muffins! I love coconut oil but have a problem with the taste completely taking over and masking the other or main flavors of whatever I’m making. And then the oil has a bit of a bitter after taste. Can I cut the coconut oil in half and use butter for the other half or jus use another healthy oil like grape seed oil which is flavorless? Or any suggestions to make the coconut oil flavor so it’s not so overpowering? Hi Evie! I find it works well in this muffin because of the coconut flour combination and is not overpowering to my tastebuds. An option is refined coconut oil that will have less coconut flavor, however is not as healthy as unrefined. I’ve never baked with grape seed oil so I can’t speak to that, but coconut oil is a replacement for butter so you could try it with that if you prefer! These muffins are amazing! I substituted the eggs with 1 cup of banana due to an allergy and they turned out amazing! So fudgy! I’ll be making these again over and over! This turned out amazing!! I did run out of coconut oil and used canola oil instead. I also learned a trick a while ago. Bake at 400 for the first 5 minutes, then reduce heat to 375 as per directions. Always yields great muffin tops! I totally love this and will mske again! I am so thrilled that these actually rose and therefore look like real muffins! My coconut flour was very thirsty so I added quite a bit of coconut milk. It is a touchy baking ingredient. Thank you for sharing a great recipe. These had a beautiful texture, and smelled wonderful! Sadly, a teaspoon of salt is way too much for my taste I think 🙁 I will try this again, but with less salt. I wish I would’ve read all the comments, because now I see I’m not alone! Maybe I’m just not used to a lot of salt because I don’t eat much of it. Oh well, next time! Thanks for sharing! They are good, but a tad bit too much salt and a bit more maple syrup would be better. Will make again! There is no way the muffis in the images above are those of this recipe. I have a culinary degree in pastry and just made them… They’re abysmal. I really wish bloggers wouldn’t try to deceive their readers. 100% of my recipe photos on this site are taken by me of the actual recipe that I post. I didn’t develop this recipe (it’s from my friends coconut flour cookbook linked in the blog post!) but I had no trouble with them. The only feedback I’ve received from some is to cut back on the salt a bit. Sorry they didn’t turn out for you but don’t question my authenticity. Dr put me on a gluten free diet plus keto, these are hands down the best keto muffins I’ve ever had! I just switched the starch for xanthan gum and made it keto friendly. Delish!